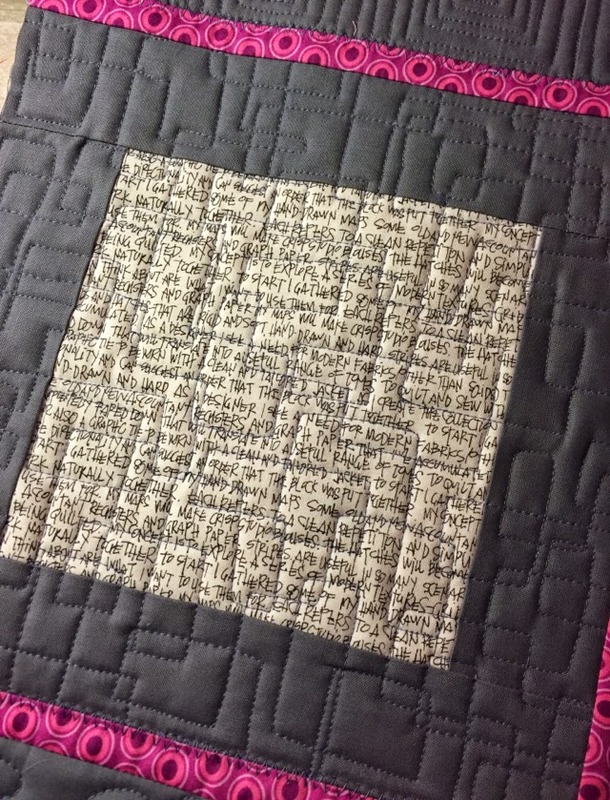 In my last blog post, I mentioned I had been working on my FMQ Sampler quilt. I finished it this week so I’m ready to show it all off! 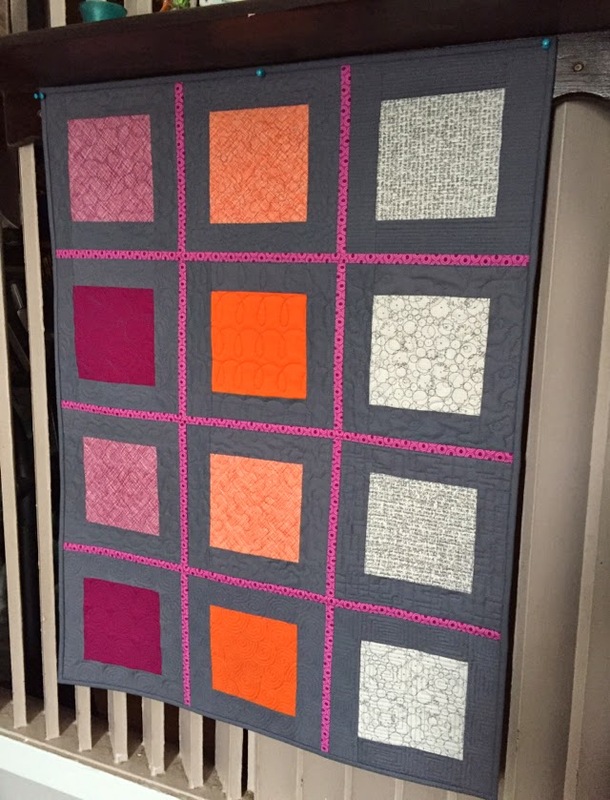 I started this quilt way back in October 2014 during a FMQ workshop organized by the Montreal Modern Quilt Guild. The fabulous MR Charbonneau from Quilt Matters led the workshop and can I say – she’s an amazing teacher. 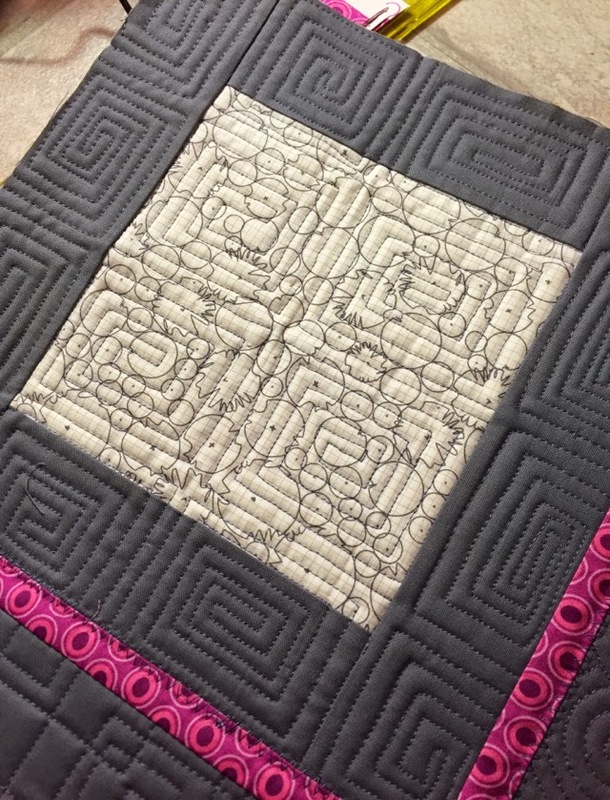 We learned 12 different FMQ designs during the class and MR also demonstrated a really cool quilt-as-you-go method for joining the blocks once they were quilted. But all of the designs she showed us where a lot of fun. I chose to join my blocks completely by machine instead of hand-stitching the sashing to the back. 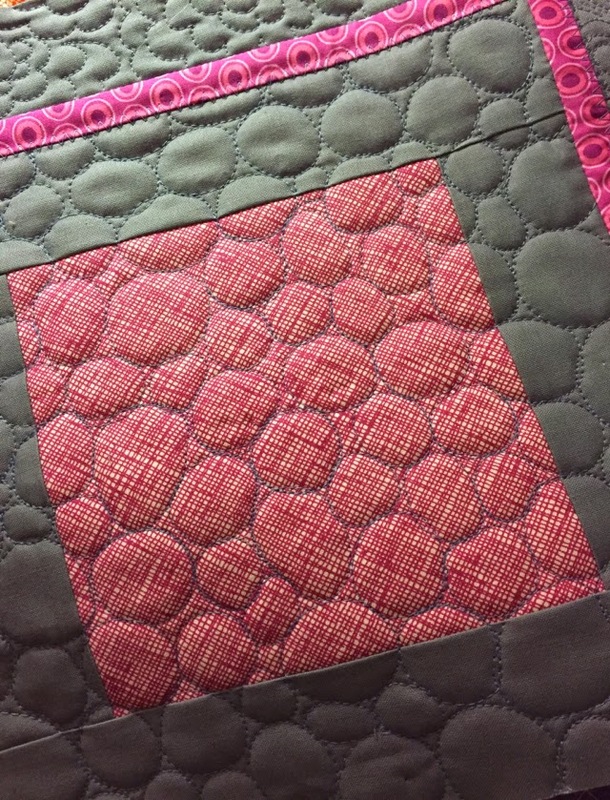 I used a zigzag stitch on my machine and find it adds a bit of fun to the overall design. It’s also a lot more secure that way because my hand-stitching is dreadful! 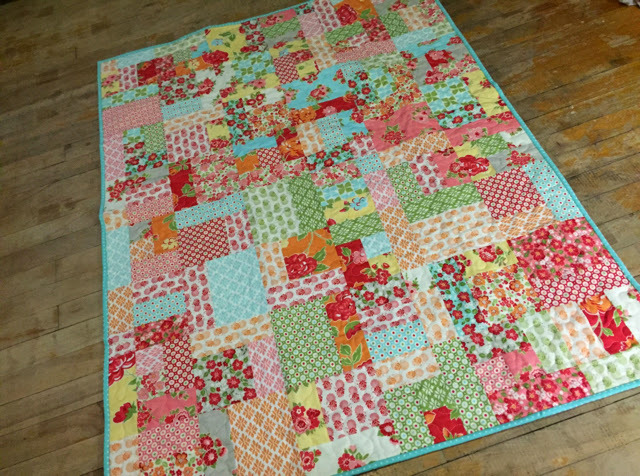 The quilt-as-you-go method was so much fun, I will definitely use it again. Linking up at Persimon Dreams for TGIFF. Over the last week, I was hoping to get started quilting my SuperNova top. Before I could get started on it though, I had to order more Aurifil thread. So while I waited for the thread to come in I pulled out the blocks I had pieced for the FMQ workshop I attended last Fall with the members of the Montreal Modern Quilt Guild. 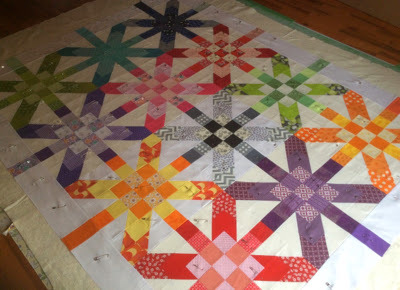 I quilted all the blocks and put them together with a quilt-as-you-go piecing method MR taught us during the workshop. All that’s left to do is sew the binding on. Linking up at Lee’s for WIP Wednesday. Friends of ours had a sweet baby girl right beforeChristmas. I knew I needed to make aquilt for her, but with the Holidays and work, I wasn’t able to get started onit until late in January. By then, Iwanted to make something quick and easy, but wasn’t sure what pattern or fabricto use. That’s when I noticed a Marmalade (by Bonnie & Camille)layer cake sitting on my cutting table. 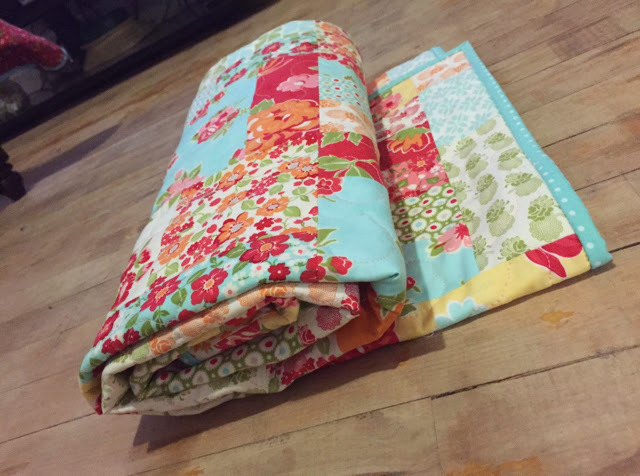 I had taken the stack of fabric out of my stash because I was planningto make the Scrappy Tiles pattern by Cheryl Brickey of Meadow Mist Designs wayback in the Fall. 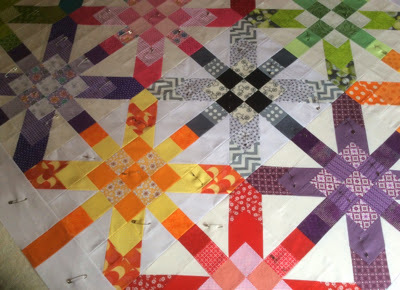 I started cutting the fabric almost immediately and before Iknew it, I had a baby quilt top all pieced and ready for quilting. If you're looking for a fun, fast and easy pattern that would look good with any fabric, I highly recommend Cheryl's pattern. To purchase your copy, just click on the link above. 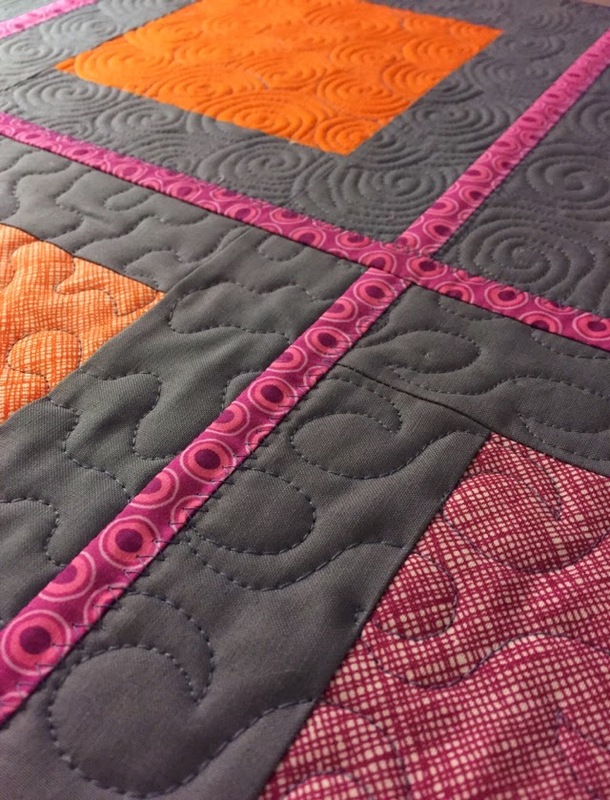 The quilting was quick and easy – a big meandering stitchwhich kept the quilt nice and soft. For the binding, I chose a beautiful aqua dots fabric from the Vintage Modern collection which goes reallywell with the colours in the Marmalade fabric. Now I just need to wash and dry it and deliver it to the newparents! Linking up at Crazy Mom Quilts for Finish It Up Friday andat The Carpenter's Daughter Who Quilts for TGIFF. It’s been incredibly cold in Montreal the last month and a half and I’m definitely not a winter person. So most of my evenings and weekends have been spent indoors quilting, sewing or crocheting. I am steadily working on my FAL goals for the first quarter of 2015. In fact, I’m finished with three of my five WIPs and we’re just halfway through the quarter. Yay for me! This week, I finished piecing the top of my SuperNova quilt and spent an hour on my hands and knees on Saturday pin basting it. Probably my least favourite part of the whole quilt making process. The blocks were made by my friend Julie and me as part of the SuperNova Friendship Swap last summer. 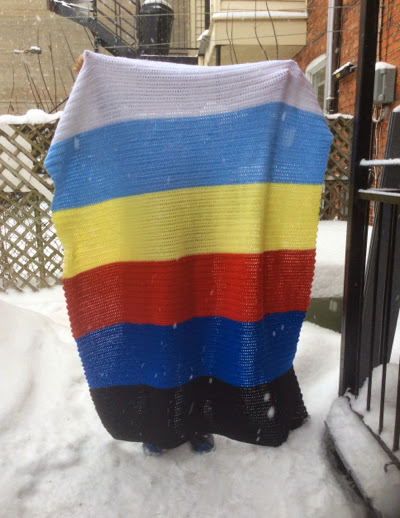 Julie and I decided to go with a single colour scheme for each block along with a Kona Snow background. The goal for the swap was to make five blocks for ourselves and five identical blocks for our friend. 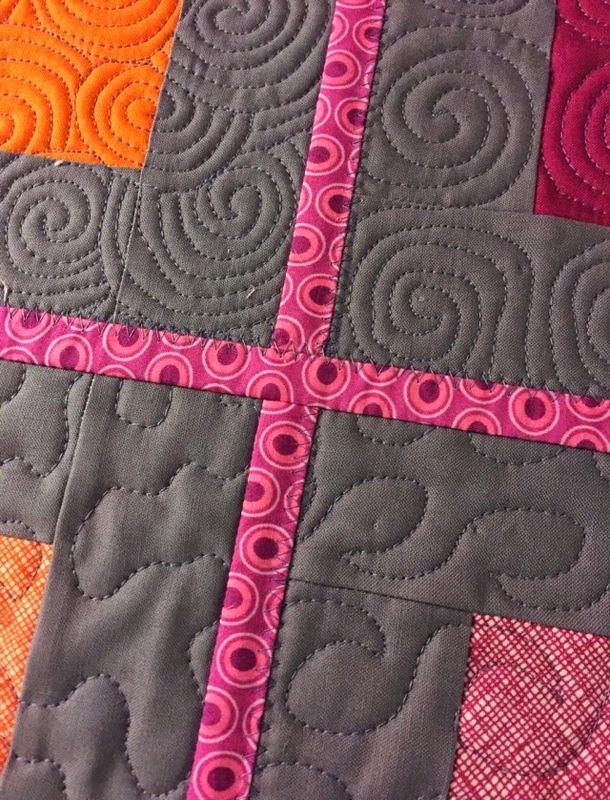 That meant ten blocks… nine for a lap quilt and one for the backing or for a pillow. Julie finishes hers way before me (you can see hers here) and when I saw that she added two blocks to make a bigger quilt, I decided to do the same thing. These are my two extra blocks. Notice something strange going on there? 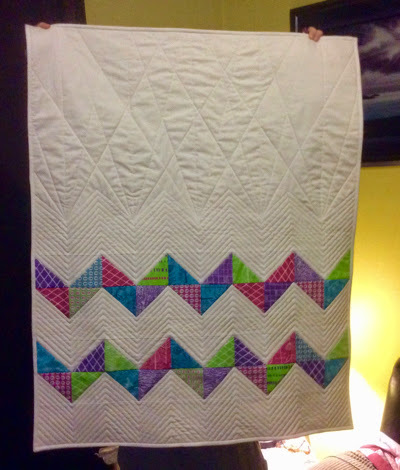 Yup – because the lighting in my sewing room is terrible, I ended up using Kona White instead of Kona Snow for my two extra blocks AND for the border! Of course, I only noticed my mistake once I brought the quilt top to the cottage for basting. The room I used was very bright and really highlighted the difference between the two solids. I decided to just go with it and leave the top as it was. This is not a quilt for a show and it’s not a gift – this quilt is destined to become a bed quilt at the new island house. I’m hoping for a big reveal in a couple of weeks. I’m on fire! Three Friday Finishes in a row! The finish I’m sharing today is a little bit different fromwhat you are used to seeing from me though. I finished my very first crochet blanket this week. Yay! The pictures aren't great - I only had a 10 year-old on hand to help out and it was snowing really hard so not a great time to try artsy photographs! This project started during the holidays as a way for me to practice my crochet skills. 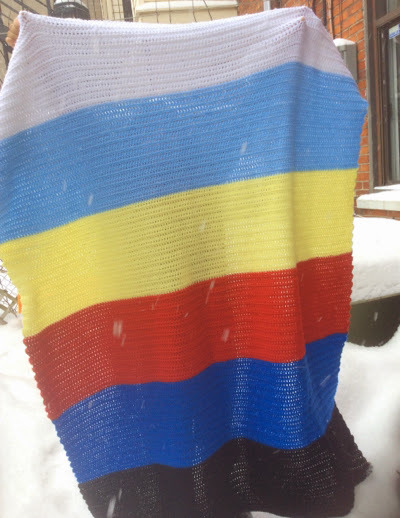 I didn’t want to do anything fancy – just double-crochet rows in a variety of fun colours. I bought six skeins of RedHeart Super Saver yarn at my local Michael’s and just switched colour whenever I would run out of yarn. As you can see from the picture, the size is just big enough for my 10 year-old to hide behind and is perfect as a couch blanket for whoever is in the mood for a nap. It finishes at about 50” x 60”. This is finish number 3 on my 2015 Q1 FAL list. I am happy to announce that my latest finish is nameless no longer. Her name is now "Northern Lights" and I love it! Congratulations to Amy E who came up with the name. I've already emailed Amy to let her know. Thank you to everyone who left comments on my last post - your suggestions were all very good.